A.J. Michaelson had just won a national championship. Now it was time to make a phone call. So Michaelson punched up the number for Don Lucia and pressed the call button. When the University of Minnesota men’s hockey coach answered, “I told him I wanted to be a Gopher,” Michaelson said. “He said, ‘Welcome aboard, glad to have you,’ ” Michaelson said about his Sunday, Nov. 7, phone call that came after Michaelson’s team, Minnesota White, won the Bauer National Invitational Tournament at New Hope Ice Arena in New Hope. And just like that, Michaelson, a junior forward who one of the state’s most coveted recruits, wrapped up a recruiting saga that included visits to most of the top midwest WCHA schools and finished with the highly anticipated phone call. Michaelson’s second choice was the University of North Dakota, but he’d been leaning heavily toward Minnesota throughout the process. “When I was growing up, ever since I was 5, I wanted to be Gopher,” said Michaelson, who lists current NHLers Phil Kessel and Thomas Vanek as two of his favorite former Minnesota players. Michaelson said the drive to the Minneapolis campus from his Apple Valley home is “no longer than 25 minutes” and that his family is particularly excited about his decision to stay close to home. Michaelson said he was excited about the possibility of playing with other incoming recruits, including Eden Prairie senior Kyle Rau. Most notably, however, is the commitment of former Lakeville North standout defenseman Brady Skjei. Michaelson and Skjei are longtime golfing buddies who have also played together on numerous elite and all-star teams. “He’s a great player,” Michaelson said about Skjei, who is playing for the USA Hockey’s National Development Team Program this winter. The 6-foot, 182-pound Michaelson was ranked No. 1 on the Hockey Hub’s list of the state’s top sophomores at the conclusion of last season, and he visited Minnesota, the University of North Dakota, the University of Minnesota-Duluth, Wisconsin and Bemidji State. All of those programs made scholarship offers. Michaelson scored 19 goals and added 16 assists last season as the Eagles made a surprising run to the state Class AA tournament semifinals. Last summer he turned down an offer to attend the National Development Team Program in Ann Arbor, Mich. The Eagles are ranked No. 5 in Class AA in the Hockey Hub's preseason "Encyclopedia." Bolstering the Eagle's already lineup, and in more breaking news, Michaelson said standout defenseman Vince Pedrie was back roaming the hallways at Apple Valley high after spending part of the fall playing for the Kansas City-based Russell Stover Midget AAA 18-under team. "He came back today," Michaelson said about Pedrie, who is listed as having three points (one goal, two assists) in three games with Russell Stover. "It was a shock when he showed up. He said he would have missed it." Apple Valley coach Jerry Hayes said, as of Wednesday, Pedrie was not enrolled at Apple Valley high and that Pedrie's potential eligibility with the Eagles still was being determined. Michaelson, who was drafted by the Waterloo Blackhawks of the United States Hockey League and also selected by the Portland Winter Hawks in the Western Hockey League’s draft, has said he chose to stay at Apple Valley in largely because of the opportunity to chase a state title. Michaelson scored 11 goals and added 13 assists in 23 Upper Midwest High School Elite Hockey League games this fall and was selected to play on one of two league teams entered in the Bauer National Invitational Tournament Nov. 5-7 in New Hope. Michaelson registered a goal as Minnesota White won three games en route to the tournament title. 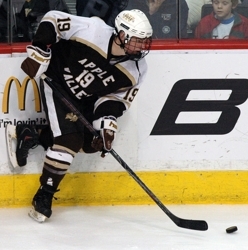 Michaelson is the fifth Minnesota high school player to commit to a Division I program heading into the 2010-11 season. Blake’s Ryan Bullock (Dartmouth), Wayzata’s Tony Cameranesi (Minnesota-Duluth), Virginia’s Garrett Hendrickson (St. Cloud State) and Eden Prairie’s Kyle Rau (Minnesota) are the others. Michaelson is the only junior on the list. Apple Valley begins the high school season on at 7:30 p.m. on Tuesday, Nov. 30 against Bloomington Jefferson at the Bloomington Ice Garden.